The bane of an system/network administrator’s life is when Active Directory administrator passwords are lost or simply forgotten. For the unprepared, losing an admin password can cause extensive disruption to work flow and even business processes. Here I’m going to explain the various approaches that can be taken when faced with this problem. There are essentially two approaches to recovering Active Directory passwords: cracking by brute force and resetting passwords. Various tools exist for both approaches. The brute force approach involves a dictionary attack against the Active Directory database (ntds.dit). There are many best well-known password cracker tools available on the net, which could be used to crack Windows local admin/user password, but they are unable to extract password hash from Active Directory database. So they are useless when you forgot Active Directory password. However, you can easily reset the Active Directory password you’ve lost. Using a Live CD is the only option to access the Active Directory database offline so you can reset the password hash for a given Active Directory user account. Password Recovery Bundle is the right software which can help you reset Active Directory admin/user passwords quickly and easily. Just launch Password Recovery Bundle and click on the Windows Password button, it allows you to create a Live CD/USB which can be used to boot your domain controller and reset your lost Active Directory password in just a few mouse clicks! How to recover Active Directory password when you forgot it? 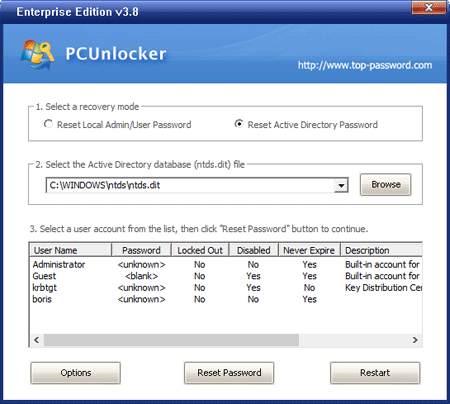 It is not so simple to recover the Active Directory user password than Windows local account. You can use the freeware Ophcrack to reset your forgotten Windows local account password but it doesn’t work for Active Directory user account due to its superior security characteristics. Actually, you can also recover forgotten Active Directory password easily if you pick up the right solution. Here we’ll recommend the Password Recovery Bundle, which allows you to create a bootable recovery CD or USB and use it to recover Active Directory password on Windows Server 2008/2003/2000. Let’s see how it works! Download and install Password Recovery Bundle on another computer that you can log in. Prepare a blank CD and insert it into the computer. If your computer doesn’t come with CD drive, you can use USB flash drive instead. Launch Password Recovery Bundle and click on Windows Password button, it will display the ISO burning window. Choose your CD you’ve plugged in and then click on Start Burn button to create a bootable recovery CD. After you have the recovery CD, put it into the CD drive of your domain controller whose password you want to recover. Turn on the domain controller and have it boot from the recovery CD. You may need to go into BIOS and set CD/DVD as the first boot device. After booting from the recovery CD, it will load the Windows PE operating system inside the recovery CD and start the Reset Windows Password program. Choose the Active Directory NTDS.dit database, it will display a list of domain user accounts inside the NTDS.dit database. Choose a domain user account from the list, then click on Reset Password button, the program will replace the forgotten/unknown password with a new password: Password123. Take out the recovery CD and reboot your domain controller. You can then log in to your Active Directory user account with the new password. The Active Directory password recovery solution works on both 32-bit and 64-bit domain controller. Forgot Active Directory password is one of the most annoying thing for network administrators in medium to large organizations. If the domain controller is very important for your company, then you have to find some other ways to recover Active Directory password than formatting and reinstalling the server. There are many excellent Windows password recovery software available on the internet, but none of them are able to recover Active Directory password. Active Directory password is encrypted and stored in the NTDS.dit database. Once you’ve forgotten the password, you have no access to all your computer files. So we need to create a Live CD and use it to boot your domain controller for performing password recovery. Password Recovery Bundle is the only software you need in this tutorial. How to Recover Active Directory Password with A Live CD? Prepare a blank CD and insert it into the computer. 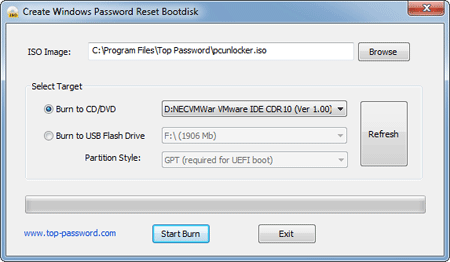 Launch Password Recovery Bundle and click on Windows Password button, it will display the ISO burning dialog. Choose your CD you’ve plugged in and then click on Start Burn button to create a Live CD. After you have the Live CD, put it into the CD drive of your domain controller whose password you want to recover. Turn on the domain controller and have it boot from the Live CD. 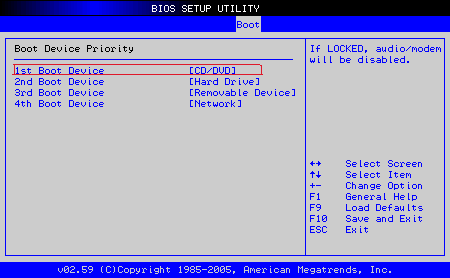 You may need to go into BIOS and set CD/DVD as the first boot device. After booting from the Live CD, it will load the Windows PE operating system inside the Live CD and start the Reset Windows Password program. Remove the Live CD and restart the domain controller, you can then log in to your Active Directory user account and recover access to all data and files on your domain controller. The Active Directory password recovery procedure is simple and fast! No need to spend a lot of time to rebuild your server. Active Directory allows Windows network administrators to centrally manage the user accounts, and other resources on a network. Users can use a single username and password to log in to any computer on the Active Directory domain. If you forgot domain administrator password and don’t have any other administrative account, you’ll lose full control over your Active Directory server. Is there any way to reset a lost Active Directory password? Many people will think of some tools such as Offline NT Password and Registry editor, Ophcrack, Hiren’s Boot CD or Ultimate Boot CD. These tools may be a good choice when you forgot Windows local admin/user password, but none of them support Active Directory user passwords. As it’s known to us, Microsoft keeps encrypted passwords of Windows local accounts in SAM database, while using much stronger algorithms to secure Active Directory passwords and saving them in NTDS database. Cracking a lost Windows password is quite difficult for us, not to mention cracking Active Directory password. But it doesn’t mean we can’t get around the problem. We can still reset Active Directory password quickly and easily. First we need to find another accessible computer to download and install Password Recovery Bundle. Launch the program and click the Windows Password button, it allows you to create a password reset disk, which will be used to reset your lost Active Directory password. Insert the Active Directory password reset disk into your domain controller. Restart the computer and have it to boot from the password reset disk. When the loading procedure is complete, you’ll see the Reset Windows Password program. Choose your Active Directory database (ntds.dit), the program will display a list of Active Directory user accounts. Select a user whose password you already forgot, then click Reset Password button. The program will immediately change the Active Directory password to a new one: Password123. Restart your domain controller and remove the Active Directory password reset disk, you’ll be able to log in to your Active Directory user account using the new password. It’s that easy!